THERE IS A PART SPLIT IN THE SEAM AT THE BASE, BUT NOTHING EXTENSIVE - STILL USEABLE. WEIGHT INCLUDING LID 1.860kg. WIDTH 23cm. 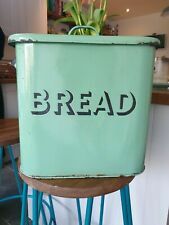 Vintage/Antique Green Enamel Bread Bin. Condition is Used. Pictures show condition but very useable. Dispatched with Royal Mail 2nd Class. Dark cream/butter coloured with green handles. Condition is Used. Rather lovely unusual Vintage French Wicker Baguette Box Bread Storage. I haven’t seen many wicker ones in my time. the lid hinges sideways. In good condition for age with just a couple of breaks to the wicker work. The base does have a couple of signs of old woodworm damage but I have treated this again 3 times myself as a precautionary measure in line with woodwork treatment. Please study photos for condition and measurements Collection welcome or postage via myHermes Many other antique and vintage items listed. If not used for bread it might be convertible to other uses such as a smoker! Designed to sit alongside our latest tinware offering with contemporary grey edging, this bread bin made from sturdy carbon steel will look great in any kitchen and features our popular 'Daisy Chain' bunnies and 'The Afternoon Nap' fox designs. The message 'The best thing since sliced bread' is printed on both sides. The bread bin measures 340mm x 245mm x 190mm. 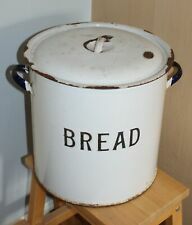 Vintage round enamel bread bin, white with blue lettering. Condition is Used. Dispatched with Royal Mail 2nd Class. HANDPAINTED VILLAGE SCENE. IN GOOD USED CONDITION. Slight mark on lid as shown in photos but does add to the look. The bin is white and "Bread" is written in black. it has a handle at each side. 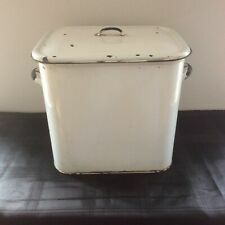 It is in good condition for its age, the bread bin has very few dinks and dents but there is signs of wear and quite a lot of rust, particularly around the base. This item is sold in fair, shabby condition although the base has gone through so it is not suitable for use. Vintage Enamel Bread Bin, Off White and a little blue. Condition is Used. The lid is a good fit to keep bread fresh. Dispatched by Courier . 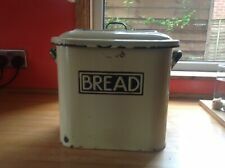 LOVELY VINTAGE 1950/60s PLASTIC BREAD BIN. There are signs of wear and tear as would be expected through age and use. These can be seen in the photographs. The lid slides open and closes fine. LARGE BLUE vintage enamel lidded storage tin. Could be used for bread etc Lovely authentic farmhouse look. Makers mark on the base reads Kockums Sweden 28cm Condition is used. 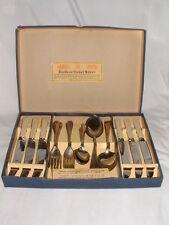 Measures approximately 30cm tall to top of lid & 37cm across including the handles. Nice Looking Piece with Great Character. IT HAS A WINDOW AT THE FRONT, WHICH HAS FIVE RADIATING TURNED SPINDLES, AND AN OPEN VENT AT IT'S BASE. IT HAS AN ARCH SHAPED TOP, WITH A HAND HOLE. THE BOX SECTION IS 30.5cm WIDE X 21cm DEEP, AND IT WILL HOLD BAGUETTES OF UP TO 70.5cm LONG, THERE ARE SCREW HOLES AT THE BACK, SO SHOULD YOU BE PRONE TO MICE, IT COULD BE WALL MOUNTED. Traditional Bin With Lid. Surface Scratches & General Surface Wear. Tools are checked for defects and lightly cleaned where necessary. Great large size and suitable as a bread bin, cracker bin, or as whatever you want. Gorgeous chocolate brown colour with a twist-on air tight lid. In excellent condition with signs of only light wear. Large Bread Bin Vintage Worcesterware Metal Cream Green Kitchenalia. Condition is used with lots of patination from years of use. Lovely cup side handles. Worcester Ware brand, made in England. Tarnished inside but full of charm and character. Great in a vintage kitchen or film /theatre prop. Cleaned ready for use. Measures approx 29cm diameter x 32cm high /33.5cm high including the lid. Dispatched with myhermes insured signed for delivery. Two cup-handle style handles on the sides. 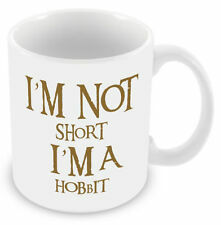 12½” / 32cm tall (excluding lid handle). Alternatively we would be happy for you to collect the item yourself. Opening Hours We cater for a variety of different styles and trends. 14' height including handle on lid. These smaller and no lettering bread bins are not common. 13” in length (15” with handles). New listingLOVELY ORIGINAL HANDMADE FRENCH COUNTER TOP WOODEN BREAD BOX BIN. IN GOOD USED CONDITION WITH JUST THE USUAL WEAR YOU WOULD EXPECT. ITS SIZE IS 45 CMS ACROSS BY 28 CMS DEEP BY 23 CMS HIGH.